"I had not expected such thoughtful assemblage of the stories, which can be so enriching an experience for anyone who wants to be an entrepreneur tomorrow. It stands out amongst the plethora of books on startups that appear today. 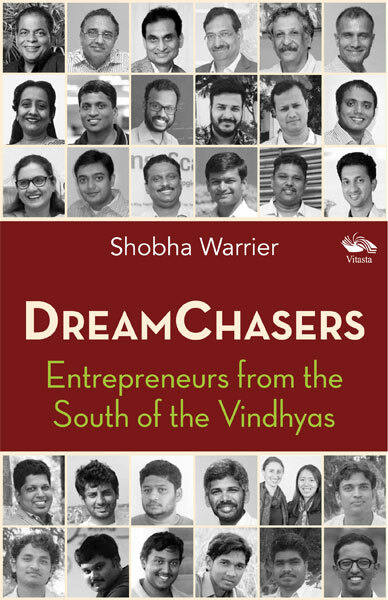 It gives entrepreneurship a context and a new meaning", writes Padmashri Prof Ashok Jhunjhunwala, praising the book Dreamchasers: Entrepreneurs from the South of the Vindhyas. This is a book on startups narrated through the stories of entrepreneurs from the 1970s, ’80s till now in three sections, The Trendsetters, The Next Wave and The New Generation. Some of the success stories featured in the book are that of Dilip Kapur of Hidesign, CK Ranganathan of CavinKare, Dr P Srinivasan of Jeevan Blood Bank, Patricia Thomas of Sandeepha Restaurant, Arun Jain of Polaris, Kalpathi S Suresh of SSI and M Mahadevan of Hot Breads. Their stories are so inspirational that they can be treated as study material for upcoming young entrepreneurs. Each story in the book epitomises the power and potential of the human spirit and the impact their efforts has on society. Shobha Warrier, a journalist with more than thirty years of experience, currently works as the Editorial Director at rediff.com and India Abroad. She is the author of two English books, The Little Flower Girl and Others – A diary of a journalist and His Days with Bapu – Mahatma Gandhi’s Personal Secretary Recalls and three Malayalam short story collections, Jalavidya, Meghana and Ramakundam. She won the Lalithambika Antharjanam special award for her book, Jalavidya in 1996, and the Villgro Journalist of the Year award in 2011 for her stories on social entrepreneurship. In her third English book, Dreamchasers, she tells the southern success stories of entrepreneurs and startups.